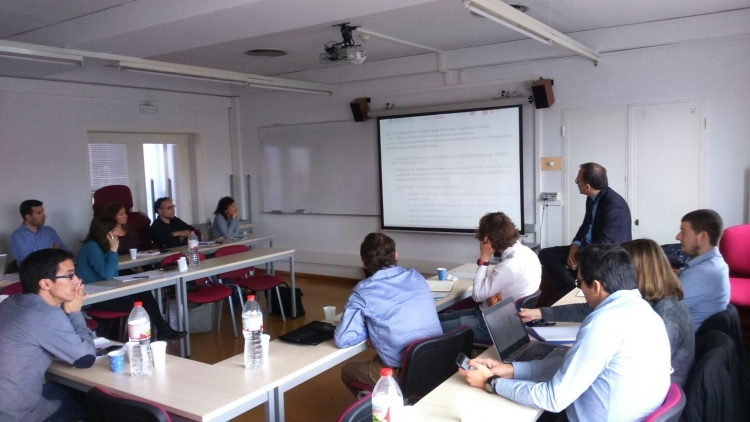 3-D bioprinting and tissue and organ matrices took prominence in the subjects discussed at the second meeting of the Advance(CAT) European Project, which was held on 3-4 May at Barcelona’s Clinic Hospital. Those attending reviewed the current status of the Accelerator for the development of advanced therapies in Catalonia and shared the progress obtained so far by the different groups and research centres. The meeting also served to set out the most immediate lines of work. The project partners see the future success of advanced therapies as dependent on the mechanisms and protocols that are implemented for the industrial production of the medicines developed. The Barcelona Macula Foundation (BMF) presented the work it has produced up to now: coordination with the team of the Centre of Regenerative Medicine in Barcelona (CMRB) for the perfecting of iPS differentiation protocols towards retinal pigment epithelium; the drafting of protocols for the atrophy model and cellular implantation; and the planning of the animal experimentation work to be carried out in the coming months. The meeting also highlighted the strengths of the project and of those that comprise it. The work groups are active and experienced in each of their fields of work; there are both basic and clinical research groups, which enables good development for translational medicine; and the degree of interdisciplinarity is high, allowing easy access to cells and tissue. This programme is funded by the Agency for Business Competitiveness (ACCIÓ) of the Government of Catalonia and the European Union through the ERDF (European Regional Development Fund) operative programme, Catalonia 2014-2020.